Photo: Firefighters work to put out the flames of a small plane that crashed into the top of a home in Puerto Montt, Chile, Tuesday, April 16, 2019. 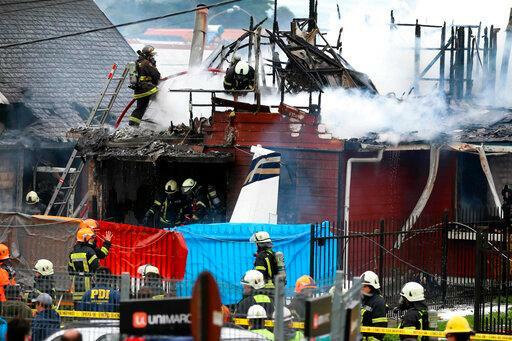 Santiago, Apr 17 : A small plane crashed on top of a home in the southern Chilean city of Puerto Montt, killing all six people aboard, authorities said Tuesday. The plane crashed at 10:50 a.m. local time near “La Paloma” aerodrome about 620 miles (1,000 kilometers) south of the capital of Santiago.